1) ANALYZE: Walk around your yard, pick up debris, rack garden areas or lawns to clean them up from messes that may have accumulated since the fall. While doing so, make note of bare spots that may need attention, or even areas of the yard that are thin. Look for patches of moss or other weeds that you may need to attend to. Try to recall from last year if there were areas of the yard that performed poorly because of competition from near plants or maybe from a lack of sunlight. The goal here is information gathering! 2) PLAN: Stop by our garden department and let us help you make a plan of attack for your yard or garden. If you suffered from weeds galore last year, maybe we would suggest applying a weed preventer at the start of spring. If you have lots of bare spots and your lawn suffers from a lack of sunlight, then we suggest that you seed early and give your grass the most time to repair itself. Maybe use a Starter Fertilizer to help thicken a thin lawn. If your lawn is acidic from rarely putting down a limestone (calcium-derived) product, then we often suggest applying fast-acting limestone to correct this situation fast. If you have lots of moss, there is a moss control that will make the removal of the plant much easier. 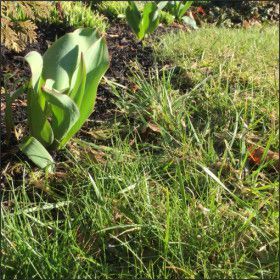 There are just so many options for spring lawn care and most of these have to do with what is most critical for you lawn. Stop by our garden department, bring pictures if you would like, and let's hash out the details together! 3) EXECUTE: It is not easy to maintain a beautiful lawn or garden, and I'll be the first to admit that I never do all that I plan for when it comes to my yard. I think that is important to prioritize as with anything. Stay ahead of curve when it comes to weeds and be sure to seed bare spots, because these areas will only make the surrounding areas worse once they fill in with unwanted weeds. Don't forget about feeding your soil and applying between 3-5 applications of fertilizer to your lawn. This will make sure that your grass is getting the nutrients that it needs to continue growing all year long.